Lufthansa Technik has posted record revenues with a 10% increase for 2018 compared to 2017, also surpassing 2017 results despite intensified price pressure and far-reaching investments in digitalization, its international network and personnel. Applicable to Lufthansa Technik AG and its 21 fully consolidated companies, sales revenues climbed by more than €500 million, surging from €5.404 billion to €5.918 billion, an increase of 9.5% above the previous year's total. The company generated adjusted EBIT of €425 million (previous year: €415 million), an increase of 2%. The company outperformed the market in 2018, with the Americas region producing the highest level of growth with a 20% increase in revenue year on year, ahead of Europe, the Middle East and Africa which rose nearly 9% and Asia generating revenue growth of 3.4%. SR Technics has renewed a wheels and brakes service contract with its longstanding customer Swiss International Air Lines (SWISS) covering its Airbus fleet for the next five years. The new agreement covers the maintenance and availability of wheels and brakes for both SWISS and Edelweiss Airbus A320, A330 and A340 fleet. All maintenance work will take place at the SR Technics wheels and brakes shop in Zurich which has provided reliable services for many years. Planet Nine Private Air, the Van Nuys, California based private charter operator and aircraft management company, has added its fourth ultra long-range Dassault Falcon 7X aircraft to its Part 135 certificate. Nordic Aviation Capital (NAC) has successfully completed its third Senior Unsecured Private Placement issuance. The issuance, rated BBB by Kroll Bond Rating Agency, was launched at US$250 million and was substantially oversubscribed allowing NAC to source a total of US$786.25 million. The new transaction consists of five and seven year tranches, with the proceeds being used to refinance aircraft within its portfolio. They will rank pari passu with all other unsecured indebtedness of the issuer, a wholly-owned subsidiary of NAC. This private placement issuance is a landmark transaction for the 29-year-old company and a further significant step in migrating to unsecured financing. Cathay Pacific Group has released combined Cathay Pacific and Cathay Dragon traffic figures for February 2019 that show an increase in the number of passengers carried and a drop in cargo and mail uplifted compared to the same month in 2018. Cathay Pacific and Cathay Dragon carried a total of 2,833,534 passengers last month – an increase of 1.0% compared to February 2018. The passenger load factor decreased 2.4 points to 81.7%, while capacity, measured in available seat kilometres (ASKs), increased by 5.9%. In the first two months of 2019, the number of passenger carried grew by 4.3% while capacity increased by 6.5%. The two airlines carried 131,320 tonnes of cargo and mail last month, a decrease of 9.9% compared to the same month last year. The cargo and mail load factor fell by 5.0 points to 60.7%. Capacity, measured in available freight tonne kilometres (AFTKs), decreased by 1.8% while cargo and mail revenue freight tonne kilometres (RFTKs) dropped by 9.3%. In the first two months of 2019, the tonnage fell by 6.4% against a 0.4% dip in capacity and a 7.1% decrease in RFTKs. CRENO, one of the leaders in high tech machining solutions, pursues its development in China as it prepares to deliver to AVIC, the Chinese OEM, a 2 in 1 computer numerical control capable of machining composite parts as well as cutting honeycomb ultrasonically. Specialized in the aeronautics industry, a high consumer of composites, CRENO will deliver its 20th specialized large machine to China. The machine will be implanted in Jinan, on one of AVIC’s locations, a Chinese equipment manufacturer and major actor of the COMAC program. workspace environment and cleanliness. It equally enables high quality precision cutting, with no deformation and is up to three times faster. This tailor-made 5 axes CNC machine has been conceived according to detailed customer specifications in answer to AVIC’s needs. Precise to a hundredth of a millimeter, the machine measures 6m long, weighs 30 tons and has a large vertical height axis (2.2 meters). MTU Maintenance, the MRO division of MTU Aero Engines AG secured around US44.4 billion in MRO contract wins in 2018, surpassing the 4 billion mark for the first time in its history. 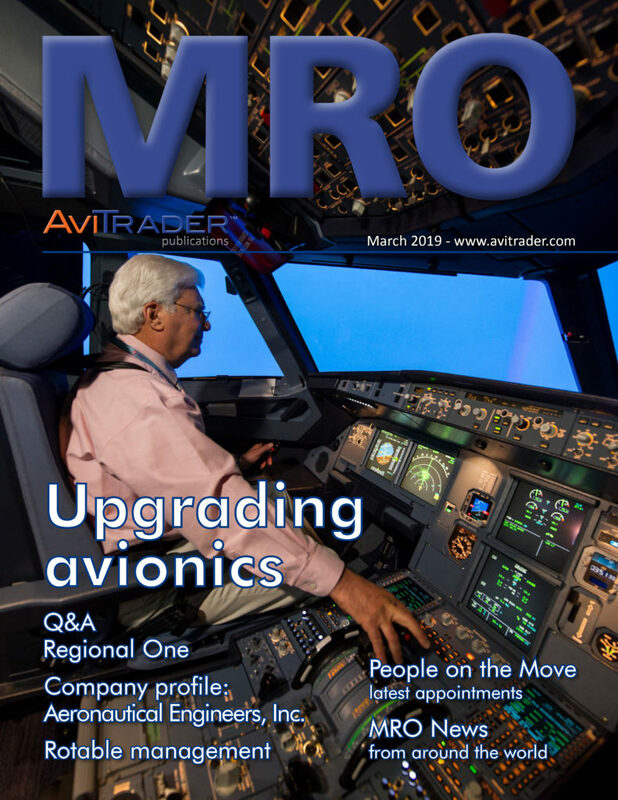 Over 300 contracts were signed in 2018, of which 46 were with new engine MRO customers. In 2018, MTU Maintenance’s worldwide facilities were operating at full capacity and the company completed well over 1,000 shop visits as well as close to 1,500 events. The highest ever number of engines went through the MTU Maintenance Hannover facility with over 400 shop visits completed. Within the network, around a third of all visits were for the V2500 engine, which is served at its three facilities: MTU Maintenance Canada, MTU Maintenance Hannover and MTU Maintenance Zhuhai. Once again, records were broken for the CF34 program at MTU Maintenance Berlin-Brandenburg, with over 130 shop visits taking place. Airfoil Services (ASSB), MTU’s joint venture with Lufthansa Technik in Malaysia also increased its proportion third party repair to 60%, with the remaining 40% of volume coming from the joint venture partners. Nearly US$400 million was won by MTU Maintenance in third party repair deals, including parts, accessory and teardown services in 2018. More than 200 third party repair customers were served and 20,000 orders placed . “This success combined with forecast repair demand in coming years is one of the reasons behind MTU’s plan to build a new European repair facility, in addition to the massive capacity expansion taking place at all facilities across our network.,” Michael Schreyögg, Chief Program Officer, MTU Aero Engines said. MTU Maintenance Lease Services B.V., an 80/20 joint venture with Sumitomo Corp. operating out of Amsterdam also significantly surpassed records in 2018, demonstrating a growth rate of about 37% compared to the previous year in terms of revenue. The company focusses on short-term lease support and asset management and expanded its portfolio in 2018 to include technical asset management services (TAMS). The range of services covers comprehensive technical consulting and fleet management, transitions management and housekeeping support for aircraft engines. 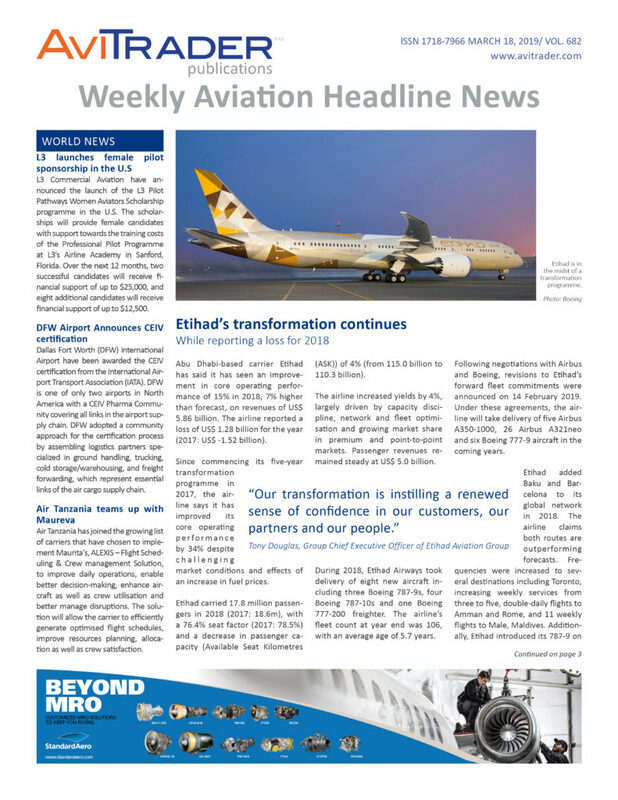 S7 Technics has commenced work under a five-year maintenance, repair and overhaul (MRO) contract signed with Kazakhstan flag carrier Air Astana. The russian aircraft maintenance service provider won the open tender for the contract in the summer of 2018. Under the arrangement, S7 Technics will perform C-checks on the Airbus A320 family of narrow-body aircraft and Boeing 767 wide-bodies operated by Air Astana. The Kazakh carrier has become the first international airline to agree on such a long-term and large-scale contract with Russia’s S7 Technics. The first aircraft Air Astana sent for a shop visit to S7 Technics was a Boeing 767. In February the Russian service provider’s team completed a C-check on this aircraft at S7 Technics’ Novosibirsk site at Tolmachevo airport. With a three-year contract award for 78 F/A-18 Block III Super Hornets, Boeing will play a vital role in the U.S. Navy’s fleet modernization efforts. The Block III configuration adds capability upgrades that include enhanced network capability, longer range, reduced radar signature, an advanced cockpit system and an enhanced communication system. Boeing will begin converting existing Block II Super Hornets to Block III early in the next decade. The fighter’s life also will be extended from 6,000 hours to 10,000 hours. This new multi-year contract benefits the U.S. Navy and Boeing by allowing both to schedule future production and Navy officials estimate this multi-year model saves a minimum of US$395 million on this contract valued at approximately US$4 billion. A 2007 Airbus AS365 N3 SN 6770, 2007 H155 SN6771, 2009 Sikorsky S76C++ SN 760710, and 2002 AW109E SN11145. At HAI Aero Asset presented its 2018 Preowned Heli Market Trends based on its proprietary intelligence and market research. Focusing exclusively on the twin-engined preowned helicopter market, the report, which hereafter will be published bi- annually, ranks the best and worst markets and aggregates 2018 helicopter trading intel, versus the previous year, leveraging key comparative indicators.